There is a considerable variety of lethal and incapacitating chemical agents and the means to deliver them. The technology needed to produce these chemicals is similar to that used to make plastics, fertilizers, and detergents. As this knowledge spreads throughout underdeveloped countries, the increased possibility of chemical warfare becomes a harsh reality. Chemical warfare agents are poisonous chemicals that can produce irritating effects, make materials or areas unusable, and cause death. The severity of the injuries depends on the type of agent, concentration of the agent used, and the method of dissemination. Nerve Agents: Nerve agents attack the nervous system and affect muscle control, vision, heart, and lung functions. The Department of Defense (DOD) considers this the most likely category of chemical agents that may be used against U.S. Military personnel engaging in combat operations. Blister Agents: Blister agents attack and destroy cell tissue causing irritation, inflammation, and severe blisters. This tissue damage increases the chance of infection and may ultimately cause death. In most cases, pain and blisters may not occur until long after exposure. Choking Agents: Choking agents cause irritation and inflammation of the bronchial tubes and lungs. If a sufficient amount enters the lungs, the liquid may gather there. Death results from a lack of oxygen. Blood Agents: Blood agents disrupt the oxygen-carrying properties of the blood. These fast-acting agents dissipate quickly in the open air but are very deadly. Blood agents also damage mask filters, so filters must be changed as soon as possible after a blood agent attack. Gases and Vapors. Gases and vapors are usually invisible. However, gas clouds may be visible for a short time after their release or in areas where there is little air movement to dissipate them. Their primary route of entry is through the respiratory tract, although some agents in heavy concentrations can penetrate the eyes and exposed skin. Gases and vapors may linger for up to several hours, with heaviest concentrations occurring in low-lying, dead air spaces such as buildings, caves, shell craters, ravines, and wooded areas. Liquids. Liquid agents can be clear to dark in color and have the viscosity of fine machine oil; thickened agents may have the appearance of motor oil. Chemical agents used in liquid form can be extremely difficult to detect with the unaided eye. The most reliable method of both detecting and identifying liquid nerve and blister agents is M8 chemical detector paper. Finally, liquid agents also release toxic vapors that can be inhaled and can remain effective for many days. Solids (Powders). Some agents are released in powder form. They can enter the body through the skin or be inhaled. Agents in dust-like form are released in a variety of climatic conditions and can remain effective for many weeks. These "dusty" agents are difficult to detect unless wetted. Once detected, they may be decontaminated with a 5 percent chlorine bleach solution. Regardless of the type, concentration, or method of attack, the best immediate protection against chemical agents is the mask and chemical-defense ensemble. The United States Military has the best equipment fielded anywhere in the world, and when used correctly, it protects against enemy chemical or biological attack. The mask is the primary piece of protective equipment. When properly worn, it protects the face, eyes, and respiratory tract against all known chemical and biological agents. In addition to the mask, the chemical-defense ensemble used by the U.S. Military includes the chemical overgarment (pants and jacket), the mask-hood, protective gloves, and protective overboots. Gas masks are not new to the military. Military gas masks were first employed en masse during the First World War to protect soldiers from gas attacks. Toxic gases were seen as a way to bring an end to the stalemate on the Western Front. The predominant chemical agents used on the Western Front were mustard gas (blister agent) and chlorine gas (choking agent). From then until now gas masks have become as much a part of the military member's personal equipment as the rifle, flak vest, and helmet. Generally, gas masks are constructed from a thick non-permeable rubberised plastic, some having an in-built protective hood covering the head. The rubberised plastic is designed to form an airtight seal against the skin. For this reason, facial hair heightens the risk of a 'bad seal' and should be avoided (this is the primary reason that the Navy changed its regulations and outlawed beards). Gas masks use replaceable charcoal filters that filter liquid, aerosol and vapor toxins from the contaminated air. Gas mask filters have a limited lifespan. They must be replaced if they are damaged, exposed to water/moisture, after a set period of exposure in a contaminated environment, after prolonged usage in a non-contaminated environment, or if their "shelf life" has expired. The charcoal impregnated overgarment is semi-permeable and must be worn over normal combat clothing. The lining works in exactly the same way as a gas mask's respirator filter, removing toxins and contaminants. The semi-permeable fabric allows some perspiration to escape. The overgarment offers protection against toxins and chemical agents in liquid droplets, vapor and aerosol form. Because the fabric is semi-permeable, it cannot protect the wearer against liquids, and wet or saturated suits (either by precipitation, chemical agent or from the military member's own perspiration) are compromised and must be replaced. Like the masks, the overgarments are designed to have a limited lifespan and must be replaced after a set exposure or wearing time. The accompanying NBC (nuclear, biological, chemical) protective overboots and gloves are constructed from thick impermeable rubberized plastic and are worn over normal combat boots and cotton liner gloves. Glove thickness can be varied for operation requirements where dexterity is at a premium. Unfortunately, while the U.S. Military chemical-defense ensemble provides a high degree of protection, it can also reduce work and combat effectiveness by hampering vision, hearing, and dexterity. It can cause mental stress and heat exhaustion during heavy workloads in warm temperatures. That's where the Military MOPP Levels come into play. MOPP stands for "Mission-Oriented Protective Postures." MOPP levels allow commanders to escalate their protective postures based on the threat of imminent attack and accomplish operations by balancing mission continuation and protection of the force. Because MOPP levels are standardized and easily understood, commanders can change protective postures without long explanations. Commanders can raise or lower protection through six levels, MOPP level 0 through MOPP level Alpha. Individual protection increases from MOPP level 0, where only conventional protective equipment (web gear, helmet, and available flak vests) is worn and chemical-defense equipment is kept nearby, to MOPP level 4, where all protective equipment is worn. MOPP level Alpha requires individuals to only wear their mask and gloves and is used as a protective posture only in certain instances after the type of contamination has been determined. As MOPP levels and the protective gear required increase, an individual's efficiency decreases as a result. Although less susceptible to being a chemical casualty, heat problems are more common. Noncommissioned Officers (NCOs) and Officers in the U.S. Military have been trained to ensure proper work and rest cycles for their "troops" are observed to control body heat buildup during chemical or biological warfare conditions. Dehydration is also a severe problem when people work in high temperatures while wearing the chemical-defense ensemble. People tend to drink to satisfy perceived thirst rather than to meet their actual physiological needs. Realizing this, the U.S. Military trains their personnel does not wait to become thirsty before drinking. Military members are trained to drink regularly while in a MOPP to optimize their performance and to avoid becoming a heat casualty, and NCOs and Officers monitor and direct their people to drink the prescribed amount of water if they do not voluntarily drink enough. The masks actually have a tube which can be used to drink from an attachment on the canteen lid, allowing military members to continue to drink water even in a contaminated environment. MOPP Level 0. In MOPP Level 0, the mask is worn in a carrier on the military member's hip. Chemical-protective gear is issued, prepared, and located so the member can retrieve it within 5 minutes. MOPP Level 0 is used during periods of increased alert when the enemy has chemical/biological employment capability, but there is no indication of use in the immediate future. MOPP Level 1. In this level, the chemical overgarment (pants and jacket) are worn, and the rest of the equipment is carried. MOPP Level 1 is used when it is determined that chemical/biological attack on the theater of operations is possible. MOPP Level 2. In MOPP Level 2, the overgarment is worn, and the overboots are worn. The mask, hood, and gloves are carried in the mask-carrier, strapped to the hip. MOPP Level 2 is initiated when chemical/biological attack is probable. MOPP Level 3. In this MOPP level, the overgarment, mask/hood, and overboots are worn, but the protective gloves may be carried. MOPP Level 3 is used after chemicals have been used by the enemy, but in areas with negligible hazard. MOPP Level 4. Everything is worn. This condition is used during/after an attack when chemical weapons have been used or are suspected. MOPP Level Alpha. The mask, hood, and gloves are worn, but the protective overgarment is not. MOPP Level Alpha is called only during certain circumstances, such as when upwind from a negligible vapor hazard agent, or when inside buildings or aircraft. 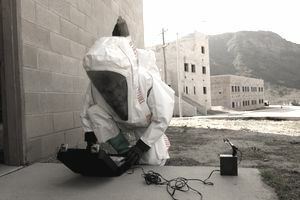 Exposure to chemical or biological (CB) warfare agents may occur during and after an attack; therefore, U.S. Military personnel are trained to use extreme caution to limit the spread of contamination. Whenever possible, critical resources such as aircraft, vehicles, and equipment are protected from contamination by placing them under cover in hangars, sheds, or other structures, or covering them with plastic sheets or waterproof tarpaulins before an attack occurs. When sheltered in a building or tent, personnel are instructed to keep windows, doors, canopies, etc., closed when notified of a pending attack and after the attack until notified that the hazards no longer exist. In addition to using protective clothing and equipment, common sense plays a large role when working in contaminated areas. Military personnel are trained to avoid kneeling, sitting, or walking in contaminated areas if possible, and not to touch anything unless it is absolutely necessary. When the mission permits, teams will be sent out to detect and mark contaminated areas. The U.S. Military has specialized chemical decontamination teams which can decontaminate equipment and land-areas, once the hazard has been identified and located. If a chemical agent gets on the skin or protective equipment, it must be removed immediately. Some agents are quick-acting and can incapacitate within a matter of minutes. The degree of injury caused by a chemical agent increases the longer it remains on the skin. The military issues special personnel decontamination kits called M291 and M295 individual decontamination kits. They are the most effective method of removing chemical agents from the skin. In the absence of a personal decontamination kit, military personnel can use a 5 percent chlorine bleach solution to remove the chemical agent from equipment and a 0.5 percent solution to remove agents from the skin. The eyes are very vulnerable when exposed to nerve and blister agents. If one of these agents gets in the eyes, military personnel are trained to irrigate them with water. U.S. Military personnel are also issued nerve agent antidotes and taught to use them, if necessary. Decontamination Powder. Decontamination powder is intended by the military for decontaminating soldiers skin and personal equipment from liquid NBC agents. The powder is usually finely ground to give it a larger surface area, making it an extremely effective adsorbent. Generally, the main ingredients are chloride of lime and magnesium oxide which provide both absorption and neutralization properties. Chemical Detection Paper. Chemical detection paper can detect and identify airborne chemical warfare agents. The paper is attached as patches to the chemical-defense overgarment using either an adhesive backing or Velcro-like bonding material. The paper is impregnated with dyes sensitive to different types of chemical warfare agent and will indicate which type of agent is present in its corresponding pigment signal. Nerve Agent Antidote. Medical representatives issue nerve agent antidotes and pretreatment during increased readiness. The primary nerve agent antidote is an intra-muscular injector with a cocktail of oxime and atropine. Additionally, medical representatives will issue pyridostigmine bromide tablets if the appropriate type of nerve agent is expected to be employed. Military members take these tablets, in advance of an attack, when directed by higher headquarters. These tablets, when combined with the antidote, limits the effect of certain types of nerve agent poisoning. In additional to chemical attacks, the U.S. Military is also prepared for attacks using biological agents, which are living micro-organisms that cause disease in people, animals, or plants, or cause materials to deteriorate. These agents can be used directly to cause diseases such as anthrax, cholera, plague, or diphtheria, or indirectly to infect crops and reduce food supplies. These diseases spread in a variety of ways including ingesting the infected plants or animals, bites from infected animals and insects or inhaling the micro-organisms. Micro-organisms used in biological warfare include bacteria, rickettsiae, fungi, and viruses (commonly referred to as germs). They enter the body, reproduce, and overcome the body's defenses. Biological agents and chemical agents are generally disseminated in the same way. The mask can provide protection against some airborne biological agents. One of the best defenses against biological agents is the body's resistance to illness. Staying in top physical condition and observing a high standard of personal cleanliness helps military members help reduce the spread of disease. Military members are routinely vaccinated during (and after) basic training for a variety of diseases. Additionally, military members who deploy to areas that are considered "high threat" for biological agents, receive the anthrax vaccine and the smallpox vaccine.